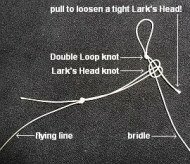 Suspend the kite from the Double Loop knot of the bridle. Shift the Prusik knot along the bridle line until the upper bridle leg makes a right-angle (90 degrees) with the spar. The kite should fly like this, but you can try shifting the knot rearwards a little for best results in lighter winds. That is, no more than a few centimeters or a couple of inches. 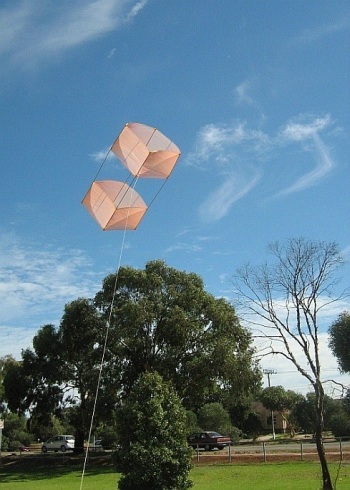 Firstly, this kite requires more than a 'very light' breeze to stay in the air. So if you can see barely any movement in the leaves of trees or bushes, perhaps take some other Dowel kite instead! At the other extreme, you might snap a cross-piece if you attempt to fly in 'very windy' weather. So, a nice average moderate breeze is best. Assuming there is a fair amount of breeze outside, just dangle the kite at arm's length until the wind catches it. As long as you feel the kite pulling, let out line slowly by taking loop after loop off the winder. Be cautious about letting line slip through your fingers. If a big gust hits the kite, the line could burn you! It's a good idea to wear a glove of some sort. The picture up there shows the Dowel Box on its first outing, in a gusty moderate breeze. Have fun flying, and I hope you've had fun learning how to make a Box kite. If the wind is too strong, the horizontal cross-piece in the upper cell will snap. So, use slightly thicker dowel for the horizontal cross-piece in both the upper and lower cells, to keep the kite balanced. Right now, all the cross-pieces attach quite close to the trailing edge of both cells. Try shifting them 0.1DL (12cm, 4 3/4”) away from the trailing edge. Don't forget the tape reinforcements too, so the ends of the cross-pieces don't puncture the sail. This change should reduce the amount of spar-bending that happens in fresh breezes, will still keeping the cross-pieces within easy reach during setup. Try my Making The MBK Dowel Box Kite PDF, if you prefer to work offline or from printouts.